What is Stopping You from Getting Fit and Strong? How can a Shirley Webb deadlift change your life? Do you need a shot in the arm to get fit? What is holding you back from getting into shape again? Is it your age? Do you think that once you hit 40 or 50, it's all over? Only downhill from there? Do you think it is possible to regain your mobility even after the age of 75? This post will address these questions. Only 5 years ago, Shirley Webb was your everyday grandma. By the age of 75, Shirley like many other seniors was finding it harder to get up from the floor without a chair for support. Even climbing the stairs was an ordeal without holding onto the handrails. One day, she went into a gym to keep her granddaughter company and ended up getting a trainer. Would you believe that Shirley did not start deadlifting until the age of 76? Well, not only did she finally start, but soon she started to compete in powerlifting. In case you never did deadlifts before, they are not easy. Shirley Webb makes it look easy, but in fact, deadlifting takes a lot of strength, power and proper form. Deadlifting 200 pounds is great, imagine 225 pounds at the age of 78. If you thought you are all washed up because you are over 40 or 50 or older, stop it. 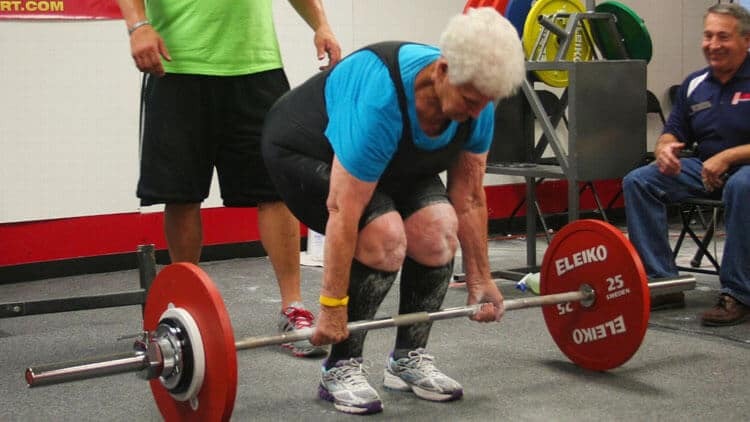 Can you imagine an 80 year old lady deadlifting 255 pounds ? See how it not only is possible, but the remarkable effects that deadlifts have had on her life. Just watch the marvel of Shirley Webb deadlift 255 pounds at the age of 80 and listen to HERcules explain how weight lifting has changed her life. The human body is amazing. Push your body more than you usually do. See how deadlifts can miraculously change your health and fitness. Never give up. Today, you can start to eat healthier, get moving, and start deadlifting. You can deadlift to compete or just powerlift for fitness. See the sensational Shirley Webb deadlift 259 pounds at the age of 81 in 2018. Deadlifting can benefit a person who never weight lifted their entire life. Deadlifts are so powerful, that they can rehabilitate a 78-year old grandmother who could not get herself up out of a chair. 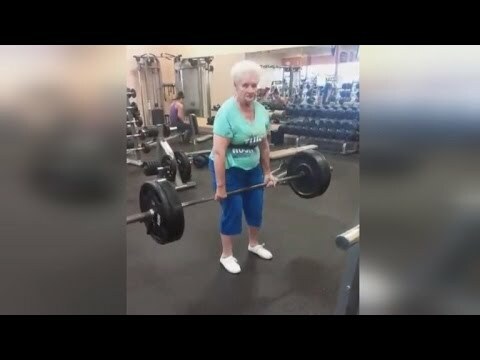 She is a 78-year-old grandmother from East Alton, Illinois, who calls the gym she hits up several times a week her ‘second home'. Webb has become an Internet sensation after a jaw-dropping video of her deadlifting 225 pounds has spread like wildfire on social media. Check out this video of a near 80 year old grandma deadlifting 228 pounds! If this does not inspire you to start a strength training program, what will? You can read more of Shirley's rise to deadlifting fame here. I have written about my own personal experience with deadlifting benefits for posture and stability here. Just about any day after a deadlift workout, I felt like I was walking taller with better posture. However, Shirley Webb's experience with deadlifting goes far beyond walking taller. When we say astonishing deadlifting benefits, this is not an exaggeration by any stretch of the imagination. In the ‘normal' course of human events, we expect our grandmothers, grandfathers and ourselves to get weaker as we get older. We probably expect any person over the age of 40 or 50 to get gradually weaker, and yes, the sight of an elder not being able to get up without help is not surprising. 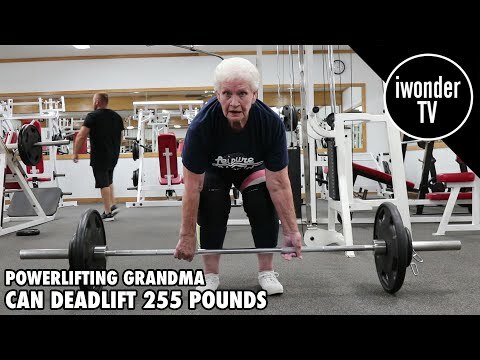 The fact that an 81 year old woman who could barely climb stairs is now deadlifting up to 259 pounds and shooting for a deadlift weight of 300 pounds is shocking to say the least. And best of all, so inspiring. If you are a teen or in your twenties, make sure that you share this post with your grandparents, especially if you have seen them struggle with walking or climbing stairs. I will never forget seeing my grandma sitting in a wheelchair at the relatively young age of 60 and not being able to walk. All of her strength was in her hands. She mesmerized me by cracking walnuts in her bare hands, but she could not walk and I felt so helpless to help her. I do not know if deadlifting could have helped her because she had Parkinson's, but for anyone out there who is struggling with having energy, power or fitness, deadlifts cannot be beat for many reasons. Believing that you must get weaker as you get older is a dangerous myth. Shirley Webb, an 81 year old lady deadlifting an impressive 259 pounds disproves that myth. Keep working out, keep strength training, keep moving your body, keep deadlifting and you can keep getting stronger no matter what your age is. If you are already over 40 or 50, then you should be even more motivated to get to work on getting fitter and stronger. There is no question that if you start now, your golden years can be much healthier, and what greater wealth than health is there? If you are over 70 or 75 and can barely walk up the stairs or get up off of the floor, Shirley Webb can inspire you to never ever give up. We take standing up for granted. But we should not, because as we get older, we lose more muscle if we are not exercising. Our body is designed to move, not sit all day with minor adjustments between the kitchen table, the car, the train, the office, the dinner table and finally the couch. Shirley could not stand up without help at the tender age of 76. Today she is doing just fine at 81. Five years ago she started deadlifting and powerlifting. The amazing benefits of deadlifting will keep your muscles strong so when you enter your seventh decade and beyond, you will still be able to stand up. As Shirley attested to above, she could not climb stairs without holding on to a railing to pull herself along. Today, she has strengthened her body to the point that she is feeling great and can climb stairs without assistance. Isn't it hard to enjoy life if you cannot get up easily, move around and climb stairs? You or your parents do not have to keep losing muscle and strength and function. No one says that deadlifting is easy, just as any exercise requires effort, but look at the results. Instead of walking around with a cane, this 81-year old grandma is competing in powerlifting championships. How great is the design of the body that even near the 80th year of life, we can turn our health and fitness around. “I hope my story encourages others to want to do the same. You don't have to go and lift 200 pounds, but anyone — no matter what age — can go out there and work out. I promise you, you will feel great. Do you need more proof of the powerful benefits of deadlifts than this quote from an 81-year old grandmother who started deadlifting only five years ago? Those are great intentions, but the question is how to achieve physical and mental independence. Here is a clear example of a person gaining so much strength, that she has regained function. Without strength, every activity becomes difficult, walking, standing, getting out of a car, even going to the bathroom. At least now you know how a person can remain strong throughout their life. Functional independence is one of the most precious of deadlifting benefits. The fantastic deadlifting benefits to stay young and strong is tremendous. An older person might shy away from deadlifting for fear of injury. However, with proper form, deadlifts are not only safe, but will elicit a flood of testosterone and growth hormone. These hormone help to keep you feeling and looking young and strong. The deadlift is so powerful because you are working nearly all the major muscle groups with one exercise, the deadlift. Your legs, your arms, your back, your core, even your grip, just about every muscle in your body is going to get a workout. The deadlift is a fountain of youth because you are doing right by your body. This is how the wonder of a Shirley Webb deadlift can change your life. Because you see the miracle of the human body in front of your eyes. Your muscles get weaker because you do not use them, not because you got older. Start moving your body, start lifting weights, exercising, whatever type you prefer. Weight training works with barbells as well as with your body. Look how Shirley Webb regained her mobility and increased her strength by adding resistance training to her life. You can do the same, no matter where you are on your fitness journey. If you need to lose weight before you start weight training, find out how to lose 20 pounds in 3 months here. Check out this Infographic from https://crossfitrockhill.tabatatimes.com/author/crossfitrockhill/ which shows that you can always keep getting stronger, never give up, no matter what your age. What do you think of Shirley Webb's deadlift accomplishments? Do they motivate you?